FOR SEWERS LIKE YOU, EVERYTHING IS IN THE DETAILS! Inspired by German heritage, the PFAFF® performance icon™ sewing machine represents everything you have come to value from PFAFF® — a comprehensive and innovative sewing experience that truly delivers to your highest expectation. For over 155 years, PFAFF® has developed elegant sewing machines distinguished by sophisticated technology, superior results and ultimate design freedom. Biggest Workspace – The market’s largest working are of 12.2″width and 5.51″ height. The height under the sewing head has been increased to 3″ allowing plenty of room for your hands to change your needle and better viewing of your project. Unprecedented Lighting Design – Innovative lighting designed for the brightest workspace and the most even light disbursement. LED lighting is perfectly positioned at the most beneficial points to eliminate shadows. Power, Stability and Precision – The sewing machine design base reduces vibrations giving you the power and stability you need for the most precise results. The needle piercing power is the strongest, ideal for thicker and multi-layered fabrics. Multi-Touch Screen with a Smart Computerized Interface – Our supersized 10.1″ interactive tablet full color display with customizable interface and the screen in the market works like a smartphone or tablet. The Graphical User Interface is specially designed to meet your needs. Comprehensive Connectivity with WIFI and mySewnet™ – mySewnet™ enabled with cloud storage and automatic firmware updates via WIFI. 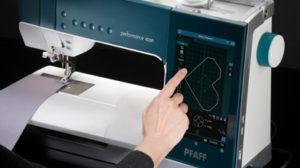 When connected to the free PFAFF® CreatorCue™ app, step-by-step sewing instructions and tutorials from the Help Center can be viewed from the comfort of your sofa, cutting table , ironing board or even while shopping. Every step syncs automatically between the app and your machine via your mySewnet™. Stitches can be loaded from the app to the machine. Enhanced Original IDT™ – Integrated Dual Feed Technology from PFAFF®, precisely feeds all types of fabrics from the top and the bottom for perfect stitching all the time. On the performance icon™ this amazing feature has gotten even better with it’s own power source for more control and a new built-in sensor will let you know when to activate or deactivate it! Automatic Needle Threader – Our fully automatic needle threader is available on the most advanced PFAFF® machine for the utmost efficiency and convenience. The thread paths with the telescopic thread guides allow you to use all of your favorite thr eads even if they are on larger spools. Innovative and Exclusive Stitch Techniques – Experience unique, advanced sewing techniques: Floating Stitches, Radiant Stitches, Single, Double and Triple Ribbon Stitches, Lace Edge Stitches and Stacking Stitches for sophisticated design. Shared Sewing Knowledge – The shared knowledge center includes Help Center, User’s Guide and Getting Started to support and inspire sewists. Our Help Center features more than 50 animated or illustrated interactive on screen, step-by-step guides for reference and efficiency in support of countless projects. ActivStitch™ Technology – With three patents, this revolutionary technology delivers precise, gorgeous embroidery even when using challenging novelty threads like metallic. Sensors measure the fabric thickness to regulate the amount of thread needed achieve perfect balance between the needle and bobbin threads. Results are perfect on both sides of the fabric. Telescopic Thread Guide – Use a wide variety of thread spools or cones with perfect results with the telescopic thread guide and reworked thread paths. Large Bobbin and Separate Bobbin Winding Motor – With the extra-large bobbin you can stitch your projects with less interruptions. You can also wind a bobbin while sewing with a second spool of thread without having to stop sewing and unthread the needle. Top and Bobbin Thread Sensor – Alerts you when bobbin or needle thread is low or breaks. Straight Stitch Needle Plate Sensor – When the straight stitch plate is attached the machine is automatically set up to straight stitch mode, preventing damage to the needle and the plate. Thread Snips – Automatically snips top and bobbin threads, pulling thread ends to the back side of fabric. Electronic Knee Lift – The ergonomic knee-lifter raises the presser foot with comfort and easy movement allowing you to keep your hands on your project. 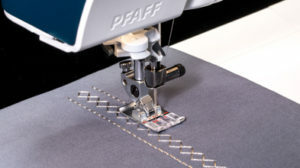 Sensormatic Buttonhole – In one step, buttonhole columns are sewn in the same direction for precise stitch quality. Free-Motion Modes – Choose between 3 modes for free motion quilting, thread painting or darning. Start/Stop – Sew without the foot control; makes sewing long seams and free-motion and easy. Stitch Width Safety – Limits stitch width to center needle straight stitch to prevent needle breakage while using a straight stitch foot. Mirror Image of Stitches – Flip the stitch side to side and/or end to end for more creative possibilities. Stitch Restart – Return to the beginning of a stitch or sequence without having to reset any special setting you have made. Needle Up/Down – Set needle to stop up or down in the fabric for pivoting, applique or more. 522 Built-In stitches – In addition to our specialty stitches, you get a wide variety of stitches including 9mm decorative stitches and Maxi stitches up to 52mm wide. 6 Built-In Sewing Fonts – 6 Fonts for combing in Sequencing plus another 2 for monogramming makes personalizing your projects easy. Enhanced Fabric Feed – With 8 feeding segments, the most in the market, it delivers exceptional feeding for professional results. More teeth have been added to the feed dogs for a better grip while additional feed dogs have been added in front of the needle for more control. Floating Stitches – With the exclusive stitch technique you can create embellishments to your project with stitches that looks like they are floating on top of the fabric with no connection stitches in between them, giving a unique hand stitch effect. Triple, Double and Single Ribbon Stitches – Add dimensional elements to your decorative stitching with beautiful ribbon stitches. With this patented technique, narrow ribbons and trims are braided into these special stitches as you sew. Radiant Stitches – Sew decorative stitches along a curved line with ease. Radiant stitches spread out equally along any curve. Lace Edge Stitches – Create delicate lace edges with thread without having to go into embroidery mode. Stacking Stitches – Sew beautiful decorative stitches in two colors. The stacking stitches consists of pairs of stitches that are designed to be sewn on top of each other. Tapering on Decorative Stitches – Taper at the beginning and/or at the end of any stitch. Change the angle of taper for unlimited creative opportunities. You can even embroidery wonderful tapers in the hoop. Stitch Creator™ Feature – Create new 9mm stitches or edit built-in stitches for unlimited creativity. Stitch Repeat – In Stitch Repeat you will find two options called Patchwork Program and Single Stitch Program. 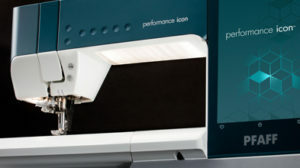 Sew your seam and the PFAFF® performance icon™ sewing machine will remember the seam length to repeat over and over. Or set the exact number of stitch or sequence repeats you wish to sew. Two Large Stitch Plates – Standard plate features seam markings to the left and right of the needle; straight stitch plate with single hole for more precision and control. 6A Sensormatic free-motion/Embroidery Foot – is used for embroidery and free motion sewing. This foot can also be used for darning. Bi Level Guide Foot with IDT™ – is especially suitable for sewing the exclusive stitch techniques such as Edge stitches and floating stitches. The underside of the presser foot is designed to be higher on the right side, and has a guide in the center, allowing the presser foot to glide along a folded edge. Extension Table with adjustable guide – Substantially increases your work area to accommodate the extra space quilters need.